I’m a big fan of pixels. Of course, I enjoy today’s dynamic 3D visuals too, but there’s a simple charm that pixel-art and lo-res imagery offer that appeals to me. I suppose having spent much of my adolescence staring at a C64 and ZX Spectrum display has a lot to do with that. 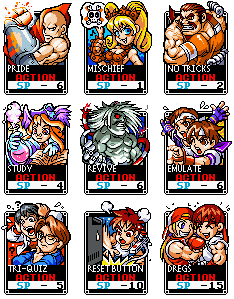 A few years back I got hold of Capcom VS SNK – Card Fighters Clash (even the acronym is a mouthful) on Neo Geo Pocket Colour and was gobsmacked by the amount of character conveyed in the cardsets. Capcom and SNK have, in my opinion, some of the most striking character design of nearly all videogames so it’s a treat to have a game reference so many of their characters in such a splendid fashion. The image at the start of this post gives you an indication of what I’m talking about. The game, alas, wasn’t one that I ever saw a great deal of. I hit a bump in my life and sold much of my luxuries. Later on, I found a good emulator, a copy of the rom and and 100% save-state and spent some time doing screen-grabs of the entire set of cards. Until recently, I thought I’d lost the images I’d saved but, happily, it turns out I was wrong. The game features 300 cards. 60 “Action” cards, 120 Capcom character cards and 120 SNK character cards. All the cards are drawn and coloured in a consistent style and look great! I’ve shared the cardsets I produced from the game and emulator in five image files containing 60 cards in each. Click on the image above or on this link to go to a public gallery to view and download the images. Please note: The images are slightly re-sized in the web-album so lose some of their clarity. Use the “Download” on the site’s menu near the top of the screen to download the original, un-altered version of each image. Whilst I’ve not bothered to check the legalities, the original art in the images I’ve shared are undoubtedly copyright and belong to both Capcom and SNK. I make no claim of ownership and will remove them should I be instructed to.